Revlon Just Bitten Kissable Balm Stains have been one of the most talked about products this Spring and Summer, so I put together some swatches and similar product comparisons to share with you. 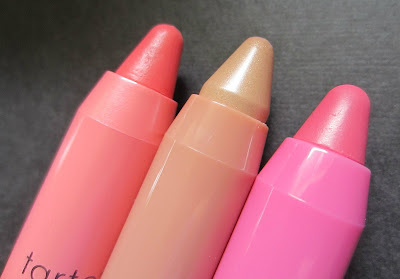 According to Revlon's web site, these lip products are a pampering balm fused with a lightweight lipstain in an adorable chubby crayon. Just Bitten Kissable Balm Stain gives softer, smoother lips with a perfect flush of color that lasts hour after hour. The gel formula comes in 12 vibrant shades that match any look or mood. They are available at Rite Aid, Walgreens, Target, and many other chain retailers. I've seen them priced from $7.49 to $8.99, and my method of procurement was to purchase them from Rite Aid using buy one get one half off deals, Revlon $1.00 off coupons, my 10% off Rite Aid Wellness discount, and Rite Aid UP reward coupons. Thanks to those discounts, I managed to buy all twelve shades for about $2.37 each. There are twelve shades available in this line, and here's hoping they add more to the line up! You can find them in tabletop displays, and hopefully you can find ones that haven't been opened and swatched. Seriously, I saw these at Target and more than half of them had the protective plastic wrap ripped open and they had been swatched. Yuck! Who does that? Thankfully, Rite Aid had theirs on an end aisle display facing the register so the cashier would be able to see someone doing such a thing. 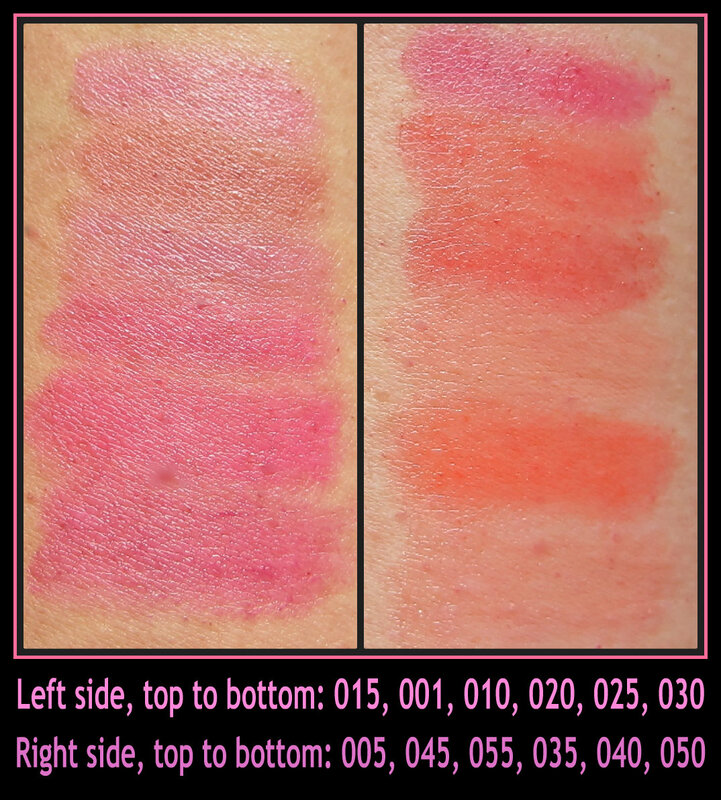 Below are the shades swatched lightly (2-3 passes) on my arm, and keep in mind that these shades are buildable should you want a more saturated color. Obviously, the lighter/paler shades are not as buildable as others. For me, Charm and Precious add very little color to my lips, but I've been using them on top of other colors for different looks. Honey is my personal favorite because it's a "my lips but better" shade for me. Whether you're looking for a punch of Summer color or just a subtle wash of color, you'll probably be able to find something you like in this product range. 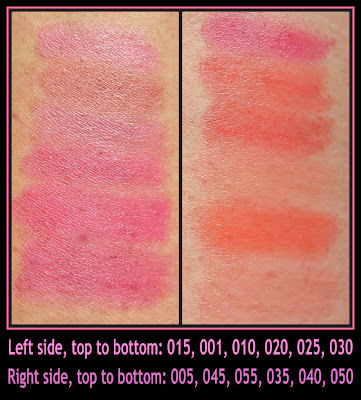 I thought it might be informative for you if I swatched them on watercolor paper also, because skintone on arms and pigment in lips varies from person to person. If you'd like to see some looks "on the lips", Gia and Kelly from Nouveau Cheap and Vampy Varnish respectively, have done some nice looks you can check out by clicking on their links. The packaging is a 4.25" long plastic stick that's 1/2" in diameter. The product is retractable by twisting the end, and it never needs sharpening. The texture feels a bit dry during the application, but it does not feel dry in the slightest once it's applied. It's hydrating and moisturizing, glossy not sticky, soft and creamy...I could go on and on singing the virtues of this product! They do have a very slight minty taste, but that fades quickly. It's interesting because it "sets" very quickly. By that I mean that although it looks glossy, it doesn't transfer much at all. I had it on the first time I used it for about 15 minutes and pressed my lips to a kleenex, and there was barely any color on the kleenex. There was definitely color on my lips though. I guess that's why they're called "kissable". The glossiness does wear off after a while, but the stain of color remains much longer than any other similar product I have. These have been compared to Tarte LipSurgence and Clinique Chubby Sticks, and while they are similar products, there are notable differences. The most obvious difference is the price: $24.00 for Tarte, $16.00 for Clinique, and $7.49 for Revlon (they are virtually all the same net weight/size in product). 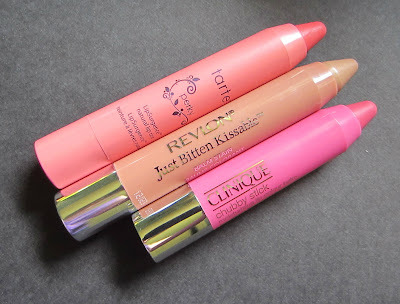 While I love the Tarte and Clinique products, I love the Revlon more, and not just because of the price. It performs better than the other two in my opinion. The stain of color lasts far longer for me on the Revlon shades, particularly the more pigmented colors. The Tarte and Clinique products both feel a little silkier during the application, but all three products have a great color payoff initially and all three products have a nice gloss to them. But after four hours, the last one standing when it comes to color is Revlon. The stain is still very obvious with the Revlon, whereas I can hardly detect the stain color at that point from the other brands. So the price point, availability (able to buy locally without shipping), and staying power make the Revlon product the better buy for me. Below is a quick side-by-side of these three products and their similar outward appearances. 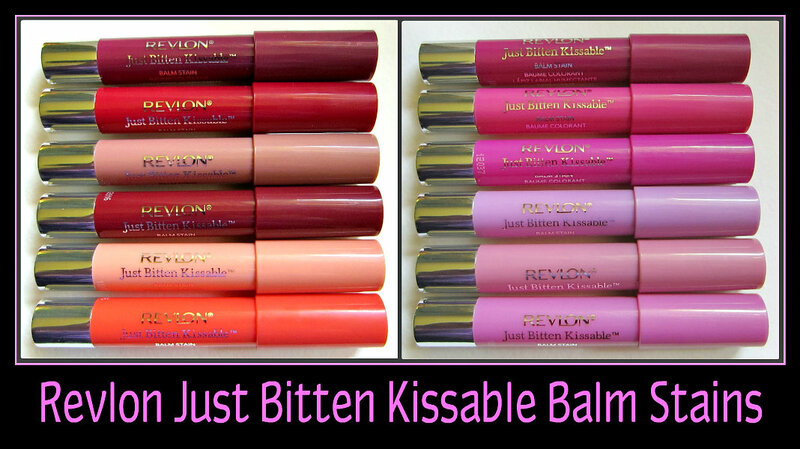 I still love all of my Revlon Lip Butters, but these Just Bitten Balm Stains are also very worthy of my lip product love! Have you picked up any of these yet? What are some of your favorite shades? I've got another Birthday Month giveaway that I'll post tomorrow, and one lucky winneer will receive three of these shades. Thank you for the swatches! I see some more I need to pick up! And you are a discount goddess! I need to be more diligent about it. This is my favorite lip's product! I have the 'sweetheart' and I'm waiting for the 'crush' & 'smitten'. Thank you for all of the swatches! You just convinced me I need Rendezvous. I loooove these stains! 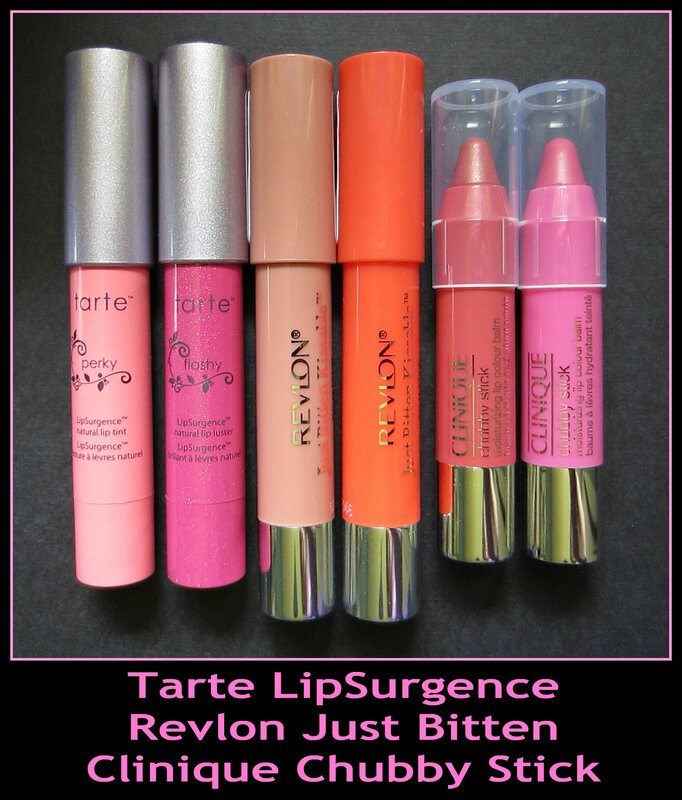 The color lasts so much longer than the Tarte lipsurgence balms - I regret spending the $24 on the one that I own. Out of the colors for this line, I have Cherish, Sweetheart and Lovesick. They are wonderful. Thanks for all the great swatches! 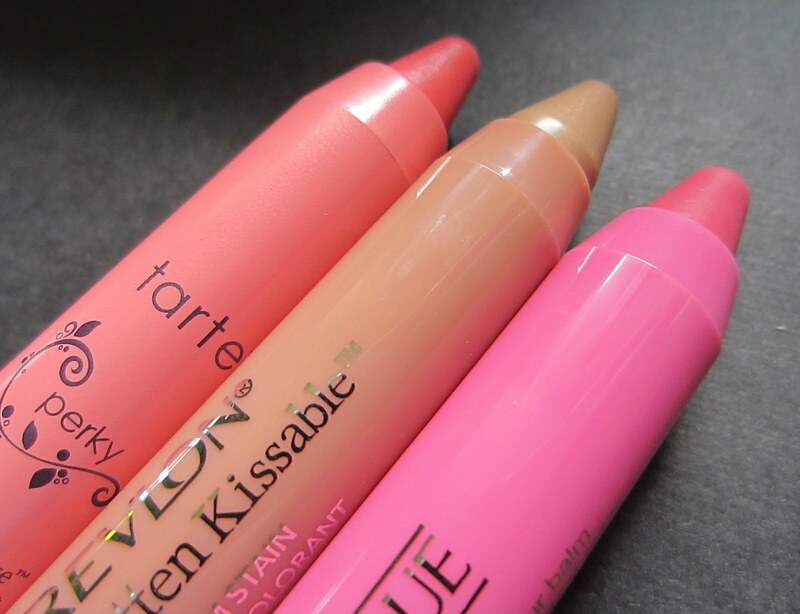 I agree that these are miles better than the Tarte product... the Tarte ran outside my lips into the lines and also didn't leave behind a stain at all. The Revlon product doesn't run, and leaves behind a great stain. I haven't tried the Clinique one so I can offer an opinion there. 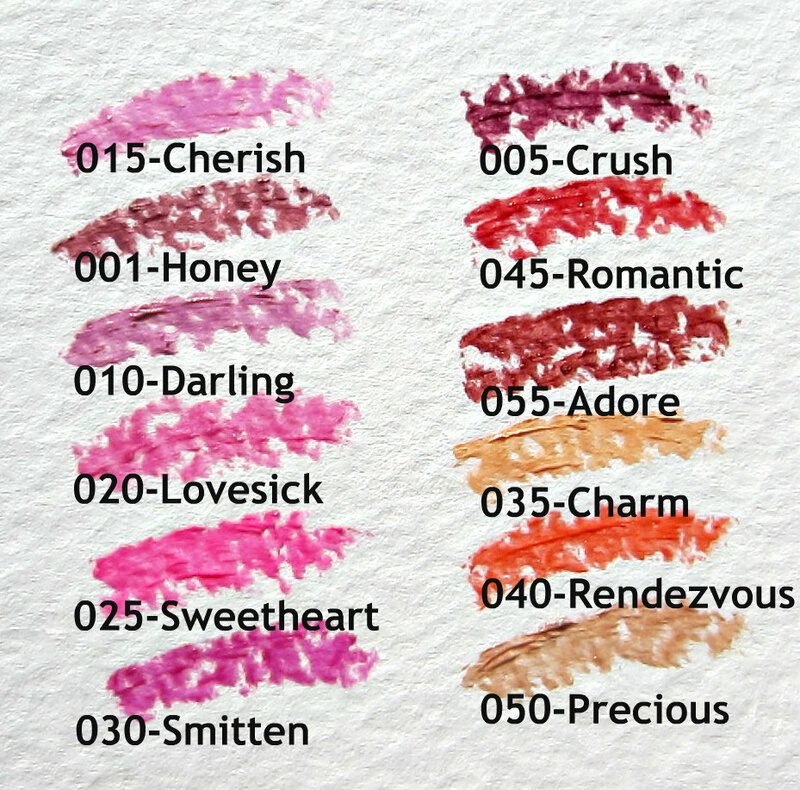 So far I have Crush, Smitten, Adore, and Rendezvous and also really want Romantic. We don't have a Rite Aid here, but I have gotten mine at Walgreens since there are doing BOGO half off, and the sales clerk used some $1 off coupons she had behind the register, so I got mine for about about $5.75 each. Not as good as your deal, but still worth it in my opinion. I need some of these! Sweetheart and Smitten look to be right up my alley! Thank you for the comprehensive swatches. I picked up 2 last night in CVS and stood there debating for a few minutes. 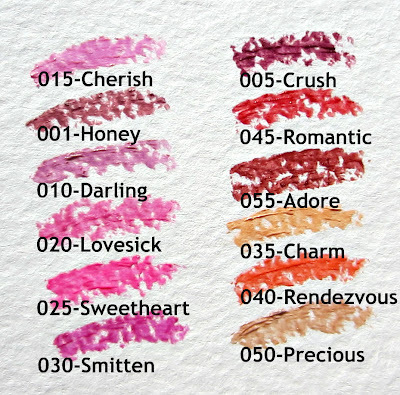 Now I know Smitten and Lovesick would have been good selections.